Tuesday to Friday 10am to 5pm, Saturdays 10am to 4pm, Free entry. 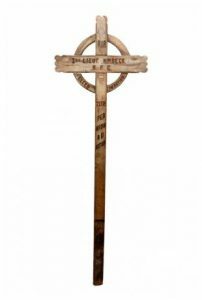 We don’t know if the cross is available to view at present. Herbert Musgrove Beck, or ‘Bertie’ as he was known, was born on 3rd December 1895 to Herbert and Ada Beck. He grew up in the comfortable surroundings of 45 Mayfair Avenue, Ilford, and was educated at Bancroft’s School and Ilford County High School. On leaving school, Bertie went to work in the City of London for the Union Castle Steamship Company. On 3rd September 1914, shortly after war was declared, Bertie volunteered for the 3rd/5th City of London Rifle Brigade. He saw service on the Western Front before being wounded in the foot in 1916. 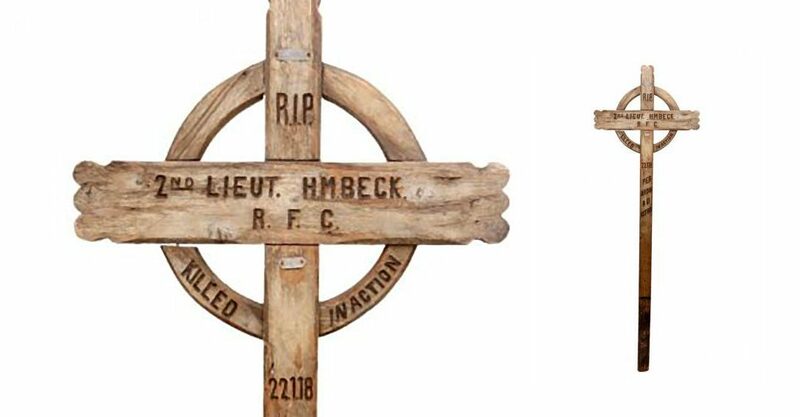 Bertie was offered a medical discharge but he declined and although unfit for infantry front lines he continued with service and was posted to the Training Reserve Brigade in November 1916. 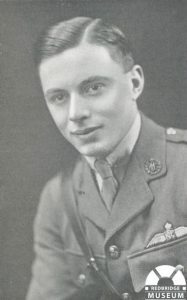 In February 1917, Bertie was recommended for a commission into the Royal Flying Corps and undertook training before successfully becoming a pilot officer. Second Lieutenant Beck went back to France in August 1917 and joined 3 Squadron, a fighter squadron flying Sopwith Camel aeroplanes. In November 1917, he had leave from the Royal Flying Corps and returned to Ilford to spend time with his family. When he returned, he continued to fly and was responsible for shooting down several enemy aircraft and attacking German trenches, a very hazardous operation. In January 1918, Bertie was posted with 6th Squadron and trained pilots flying RE8 bombers. He taught low flying bombing techniques to drop bombs into German trenches or aerodromes. On 22nd January 1918, while flying a Sopwith Camel aeroplane, his aircraft plunged 500 feet in the air to the ground. Bertie was killed instantly. He was 22 years old. He was buried with full military honours at the military cemetery at St. Pierre, Amiens, Northern France. Research by Redbridge Museum, with thanks to John Barfoot. Additional information by Patrick O’Mara Essex WFA.